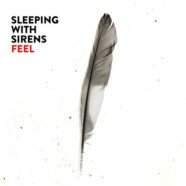 Sleeping with Sirens’ latest record, Feel, releases June 4 and will bring quite the experience to the band’s fans. Not long ago the band posted a stream of the album online and immediately the comparisons and criticisms started. “It’s too different,” “What the hell is this?” were some of the responses from fans. When listening to a new album from a band who has established themselves, it’s hard to compare it justly to their previous work. Bands evolve and change over time- it’s a part of growth. As people we don’t stay the same over the years so why expect bands to put out music that sounds exactly the same cycle after cycle. Here’s the thing about Feel– it’s not really that different from their previous works. Sure, there are some tweaks and changes but it’s still Sleeping with Sirens. Feel opens with a musical-like number which takes you completely off guard but it’s still a catchy tune. Then enter the album itself- the heart and soul of the record, the meat and potatoes of Feel. This record is a feel good record if there ever was one. The record will sonically have you dancing and singing along in no time. Sleeping with Sirens are part of that genre of rock that always changes and uses different elements on each record, experimenting to make the best, most innovative record possible. On Feel they even bring in MGK (Machine Gun Kelly for those of you who aren’t “hip” enough to know who that is)- a move that a lot of fans weren’t sure about but here’s the kicker- it works- and beautifully. Feel is a creative, artistic, home run of an album for Sleeping with Sirens and they will be bringing the album to life on this year’s Warped Tour.